Sometimes, analytics for your page or pop-up just don’t match up to what you expect to see. Below, we’ll cover common scenarios and the typical culprits behind them. You may want to adjust your analytics’ date range depending on the information you want to review. By default, the summary and graph will display analytics data from the entire lifetime of your page or pop-up. Adjust the date range to see data from different time periods. Pay close attention to which contacts are being counted when you review analytics data in your integration. For example, some services report total subscribers in your entire account by default. If you notice the number of conversions reported by our analytics doesn’t match the number of contacts in your integration, check how contacts are being counted in your integration first! Otherwise, read on below to learn about other common causes of analytics discrepancies. Sometimes, metrics in your analytics graph add up to something other than what’s shown in your page summary. That’s because metrics in the graph are specific to different time intervals, while the numbers in the summary cover the entire selected date range. For example, let’s say your page only has one unique visitor and your date range is for the past 24 hours. If they visit your page at 8 am and then again at 2 pm, your “hourly” graph will show one unique view at 8 am and another at 2 pm. But for the date range (24 hours in this case), they only count as a single unique viewer. Hourly time intervals are also time-zone specific. For instance, a visitor who opts in at noon Central time would appear on the graph at 10 am Pacific. Below, you’ll find common reasons our analytics may report more conversions than how many contacts you have. Because we count each form submission as a conversion, it’s possible to have ultra-high conversion rates in some cases (even those exceeding 100%). We calculate conversion rate as the number of form submissions (conversions) divided by the number of unique views. So if you have 10 unique views and 15 opt-ins (perhaps some unique visitors opted in twice), you’d have a conversion rate of 150%. When your page is new, it’s easy to rack up a high conversion rate just by testing your page. 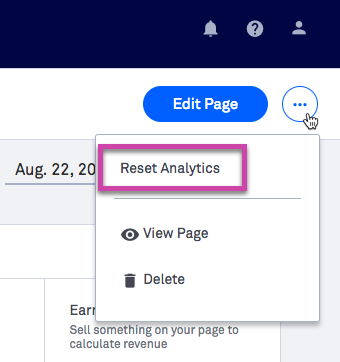 You can always reset your page’s data in the action menu of your analytics page, as shown below. If your email or marketing service uses a confirmed opt-in process, you’ll likely have more conversions (in Leadpages) than actual subscribers. That’s because our conversion total counts confirmed and unconfirmed subscribers. This often causes a slight discrepancy and is nothing to worry about. To alleviate any discrepancy, you may consider turning confirmed opt-in off. That will ensure anyone who submits your form is also a subscriber. NOTE: Some email services don’t provide this option, and some countries or regions have regulations around confirmed opt-in. Be sure to check local laws before turning confirmed opt-in off. When someone submits a form on your page or pop-up more than once, they’ll count as a conversion each time. However, it’s possible they will not count as a new subscriber in your email marketing service. Lots of services automatically “de-duplicate” subscribers based on email address. For example, if someone@anysite.com opts in to your list several times, they’ll only show up once on your email service provider's list. TIP: When testing your pages and forms, it’s usually a good idea to use a different email address (or an email alias) each time you test to avoid discrepancies. Below, you’ll find a few common scenarios (and explanations) that can cause your conversion total to be too low. Having tons of views but zero conversions can be troubling, but there’s usually a simple explanation. Most notably, we can only count a conversion when a visitor submits a Leadpages form. If you’ve built your page with something other than a form widget (or a pop-up that includes one), we can’t track conversions. WARNING: Our updated analytics system is not compatible with conversion goals, so any pages that rely on them will report zero conversions at this time. If you do use a Leadpages form on your page and still aren’t getting any conversions, we recommend testing your form to make sure everything is working as expected. And if it’s not, get in touch! We’ll be happy to help troubleshoot your form’s issues. Our analytics data only reports information for each specific page or pop-up. You’ll typically find your number of contacts to be greater than your total conversions if you collect opt-ins from multiple sources. This remains true even if you’re using multiple pages or pop-ups. For example, your list may have 2,000 subscribers, but each page will only count conversions from that page (so each one you use could have a different number of conversions). Similarly, if leads can opt-in to your system from other forms, links, etc. you’ll likely have more subscribers than conversions for any given page. Most tracking systems (including advertising platforms) calculate page views in different ways. If you run ads on social media or use third-party tracking on your pages, you may find that your pages’ analytics don’t match reports from those services. Read on to learn how some popular services calculate clicks and why they may not match your pages’ analytics. When you run a Facebook Ad, you’ll gain detailed insights on your ad’s performance. Often, Facebook’s metrics will be higher than Leadpages’ since they track more events. To learn more about how Facebook calculates clicks, check out: What are the differences between third-party ad reporting and Facebook Ads? You can view detailed activity for Tweets, which includes data on engagement, impressions and more. For Tweets that link to a page, you’re likely to see higher engagement numbers on Twitter than views in Leadpages. That’s because Twitter counts an engagement for multiple events, such as a link click, retweet, or like. You can learn more about Tweet activity on Twitter’s site here: Tweet activity dashboard.